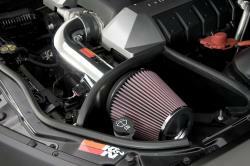 How Does a K&N Air Intake System Improve Performance? You might be wondering—what’s the best way to add horsepower to my vehicle? Aftermarket modifications like bolt-on superchargers and turbochargers can add significant horsepower, but are often very expensive—typically in the thousands of dollars—and can take considerable amounts of time and mechanical prowess to install. That’s where K&N performance air intake systems come in—giving you a guaranteed increase in horsepower without the hefty price tag of a supercharger, and typically in less than 90 minutes for installation. How does an engine make power? An internal combustion engine operates by burning a mixture of fuel and oxygen within the engine’s cylinders. The fuel injectors provide a precise amount of fuel, which combines with air delivered by the air intake system. A spark plug then ignites the volatile gas, creating an explosion that forces the piston downward—turning the crankshaft. The piston-moving force that’s created during the combustion cycle is what produces horsepower. How do factory air intake systems work? Your engine needs oxygen to create power. The cylinders in your vehicle’s engine have to have air to create the explosion that produces horsepower and torque. Since cold air contains more oxygen molecules than warm air, injecting a higher volume of oxygen-rich air into the cylinders allows the engine to burn fuel more efficiently during combustion—providing an increase in power. In a typical stock air intake system, air has to pass through a thick, disposable paper filter, and then move through a narrow system of tubing that can cause air to swirl and become turbulent. Excess turbulence causes the molecules within the air to collide, creating heat, which lowers the density of the air and reduces the efficiency of combustion. Factory systems often feature intake tubing with tight bends, baffles, and other obstacles that can slow airflow and create turbulence. These systems are also typically designed to muffle engine noise—unlike K&N intake systems, which are designed to give your engine a more satisfying growl. Why is airflow so important for my engine’s performance? Why not use a disposable paper air filter with my intake system? 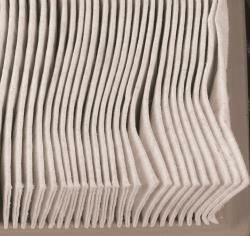 Most dry, disposable paper air filters function on a size-dependent basis—dirt particles that are larger than the openings in the filter media are trapped, while particles that are smaller than the openings pass through. Most disposable paper filters create a large amount of airflow restriction, as the openings in the filter media have to be extremely small to filter efficiently—which slows down airflow. Because dust accumulates on the surface of the disposable filter, performance typically decreases consistently throughout the filter’s service interval. Why is a High-Flow Air Filter™ better than a disposable filter? A paper filter exhibits a principle called surface loading; dust collects only on the surface of the media. In contrast, K&N High-Flow Air Filters™ utilize depth loading, where multiple layers of cotton fibers provide particle retention on many levels, and the media also features pleats to increase the contaminant-capturing surface area. As a result, K&N filters are able to hold significantly more dirt and particulate matter per square inch of media over an average paper filter. 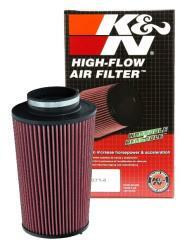 In addition, High-Flow Air Filters™ utilize the principle of diffusion to increase the capture of engine contaminants. Small particles are highly affected by forces within the air stream, such as velocity changes, pressure changes, or turbulence. As a result, the behavior of extremely small particles is typically random and chaotic. These particles do not follow the air stream, and their erratic motion causes them to collide with the filter’s fibers—where they are trapped and held by oil. This enables a K&N air filter to capture contaminant particles that are much smaller than the openings within the filtration media. 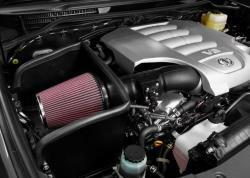 Is a K&N performance air intake system better than a stock system? K&N performance air intake systems are designed to create a more aerodynamic path for airflow to reach the engine by removing the stock intake tubing that can create excess turbulence, and also by utilizing highly airflow-efficient filter media. In a K&N cold air intake system, air first passes through a performance air filter—typically a High-Flow Air Filter™, which is designed to provide up to 50% more airflow than a disposable paper filter—and then passes through an aerodynamically-engineered tubing system that helps prevent unnecessary turbulence/heat. Cold air is more dense than warm air because it contains additional oxygen molecules—allowing the cylinders to facilitate combustion more efficiently. A factory air intake typically feeds warm air to the cylinders, while K&N performance air intake systems are designed to provide a smooth, unimpeded path for the airstream—keeping the airstream cooler and more oxygen-dense. 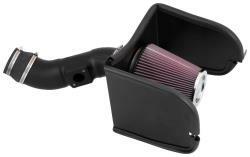 With a K&N performance air intake system, you get a guaranteed increase in horsepower and torque. Which K&N intake system should I choose? All K&N performance air intake systems are designed to increase airflow through an aerodynamic path that reduces turbulence, and filter designs that provide an increase in the volume of air that reaches your engine. K&N offers several options to cater to different aesthetic, ease of maintenance, and filter media preferences. Mandrel-bent aluminum intake tubes help provide an increase in airflow to your engine and reduce turbulence—keeping air cooler and providing more power. These systems are paired with a washable, reusable High-Flow Air Filter™ featuring oiled cotton filter media, and the oversized, conical design allows you to go up to 100,000 miles between filter services under normal highway driving conditions. A steel heat shield helps protect intake air from the high temperature of your engine bay, helping to increase combustion efficiency. High-density polyethylene (HDPE) rotationally molded tubes help accelerate airflow to your engine and reduce turbulence—keeping air cooler and providing more power. These systems are paired with a washable, reusable High-Flow Air Filter™ featuring oiled cotton filter media, and the oversized, conical design allows you to go up to 100,000 miles between filter services under normal highway driving conditions. A steel heat shield helps protect intake air from the high temperature of your engine bay, which helps increase combustion efficiency. 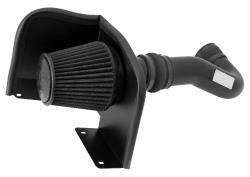 Blackhawk Induction air intake systems feature an oil-free synthetic filtration media, black powder-coated aluminum, and all-black components. The layered Dryflow® synthetic filtration media provides increased airflow and exceptional engine protection without requiring oil, and a steel heat shield helps protect intake air from the high temperature of your engine bay. Service your filter every 100,000 miles under normal highway driving conditions. 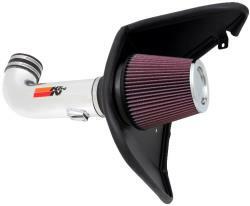 What horsepower increase can I expect from a K&N air intake system? Horsepower gains vary among products and applications, but each K&N performance air intake system is designed to increase airflow efficiency for specific vehicles and their engines. Each kit undergoes significant testing to help ensure that the filter and intake tube are positioned to deliver large increases in airflow and horsepower. Please visit knfilters.com to view horsepower estimates for specific vehicle applications. Join the millions of customers who trust K&N to provide performance and protection products for their vehicles. Visit knfilters.com to explore air intake system options for your specific vehicle.